Those are popular. I used to have mine mounted on the left (traffic) side, until one time I was stopped at the side of a busy road. The curb side is much safer, as that small part you need is always at the bottom. 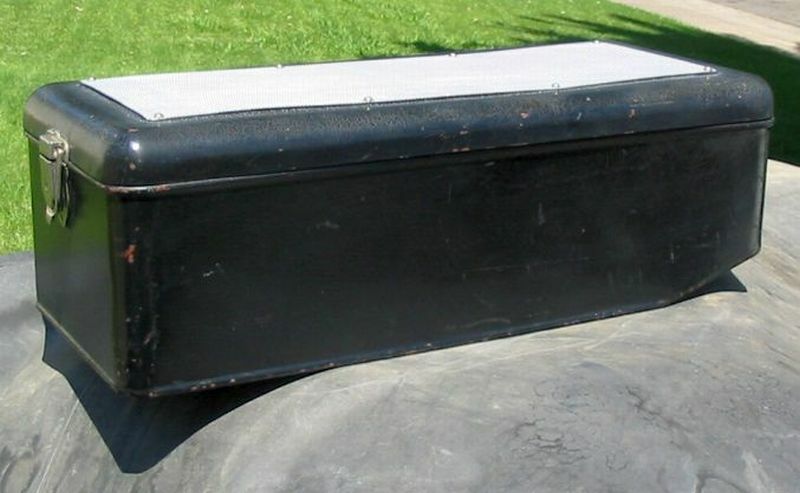 Howdy Jim, I buy running board tool box's at swap meets when I find them and pay $10 to $35 for them in good restore-able condition. I don't think $70 is a bad price if you want one to mount on your car. This is just a few that I've hauled home over the years. You have cornered the market on tool boxes, now I know why they are so expensive. I bought this one on ebay from Mike Peterson for the Tudor. PS. 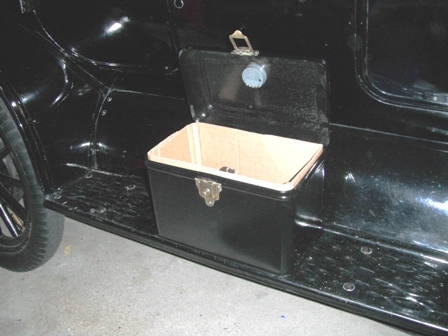 If a box like mine were mounted on the running board of a Fordor in front of the rear door would passengers simply step on top of the box to enter the rear compartment? I notice mine is slightly domed on top. Was this a form of reinforcement for this purpose? 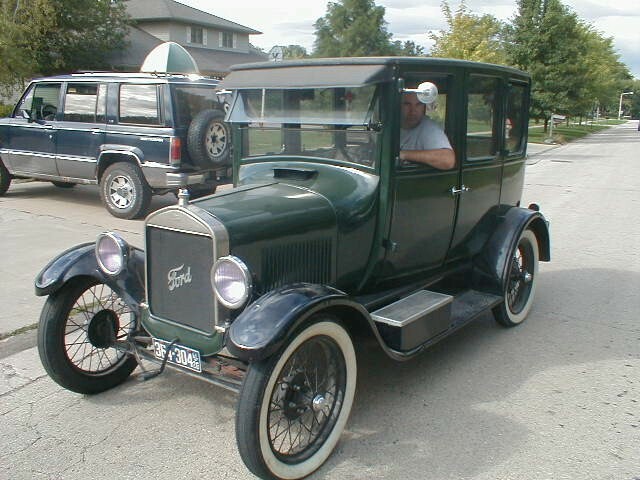 Jim.....Fordors are cars all to their own......I thought I needed a closed 4 passenger car and had a '25 Fordor for a little while. 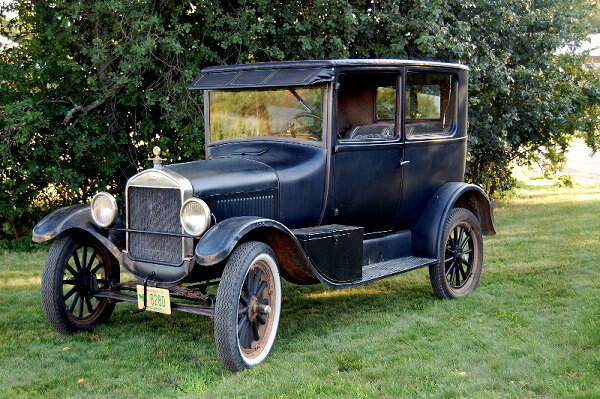 After I bought the '27 Tudor, mainly because it's closer to the ground and much easier for my wife to get in and out of (AND I wanted an Improved Car anyway), I wondered what the heck Henry had against front seat passengers in the Fordors! Jim, mine is obviously "home made" of quite heavy galvanized steel and I have never seen another like it. I think someone missed the boat by not manufacturing these in the day. A few last words.......if someone were to manufacture these I think they'd sell like crazy. The only thing I would do differently is shorten it up so the rear wall would end at the running board joint. It would still have plenty of room for a nice stash of tools and such. That looks like a Peerless Box although on the the one I had the name was pressed into the lid. There was so much paint on it that I didn't know it was there until I stripped it. 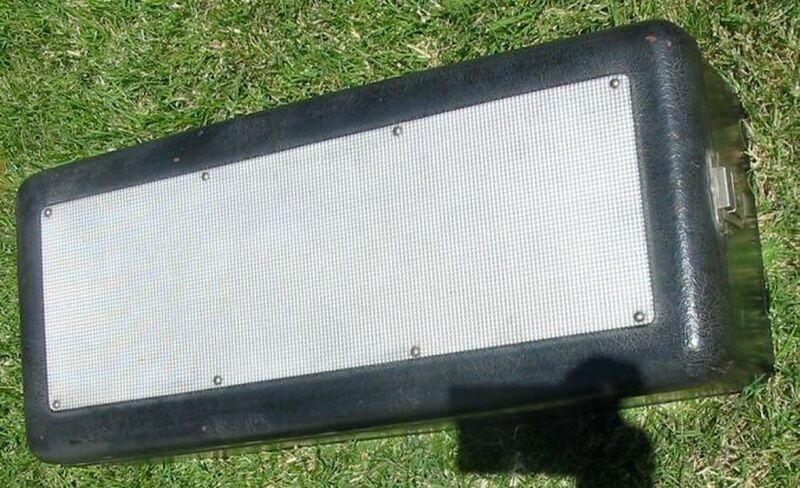 Craig, I agree your running board box would sell well if someone would offer them to fit various front fender sweeps. 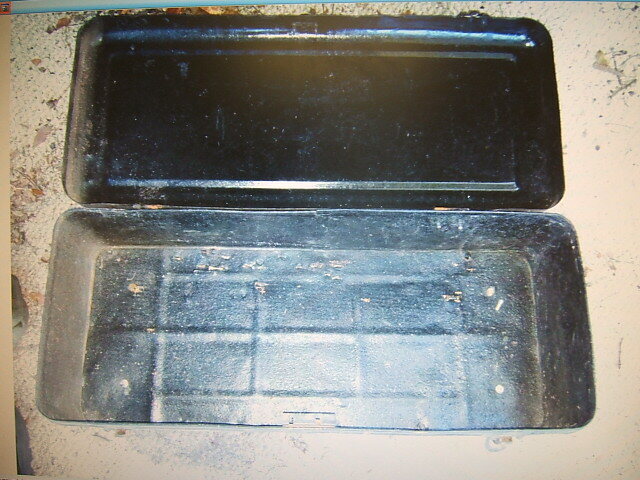 Here's a fairly similar running board box that has a shorter sweep and opens on the short side of the box. It also has a lift out tray. These boxes are great, especially for Tourings because they make for such easy-to-get-at storage�of which this body style suffers from a shortage. Yeah, the big, seldom-used things like inner-tubes and tire irons can go in the rear-seat storage compartment, but for me, it would be a pain in the neck to have to go digging in back there for my everyday stuff�things like the oil can, clean rags, roll of paper towels, my reading glasses and cell-phone. 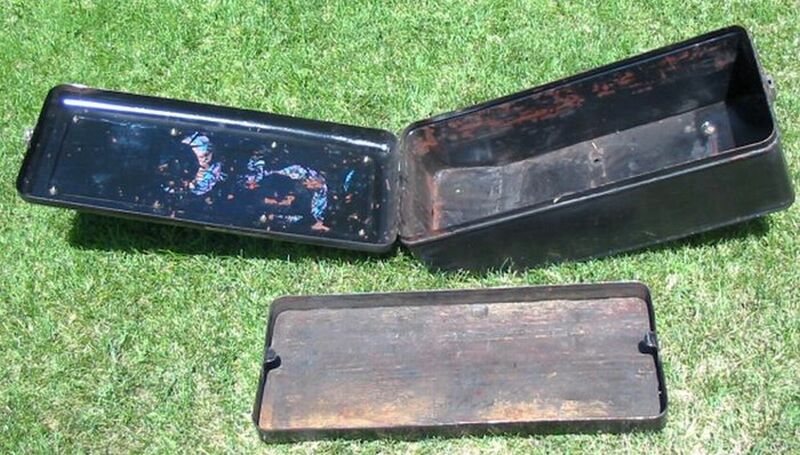 It took years to hunt down three running-board boxes (in three sizes) that were repairable and even these looked like they'd been pulled out of a landfill. All had dents, perforation rust and non-functioning key-locks. And of course, they all needed to be sandblasted, primed and painted. So why go to the trouble of fixing all that stuff? Because running-board toolboxes in presentable condition no longer exist�at least not at reasonable prices. Twenty years ago, these things were going for five bucks at neighborhood garage sales. But not any more. Two years ago, this little battery box (the rarest size) was a piece of rusted-out junk that cost me $180�and that was before I invested in what it needed to become presentable. When a rust-bucket can command that kind of money, it's safe to say there'd be a significant demand for new units (hint-hint). I remember seeing one in mint condition�with two keys!�at Hershey. The vendor had only just placed it on his table and I was in perfect position to strike, but before I could pull out my wallet, some younger, faster gun out-drew me and descended upon it like an owl on a field-mouse. The price was firm and Jesse James paid $275 for the slick, little beauty. Man, there's a completely untapped market out there! Craig, I was thinking the same thing. 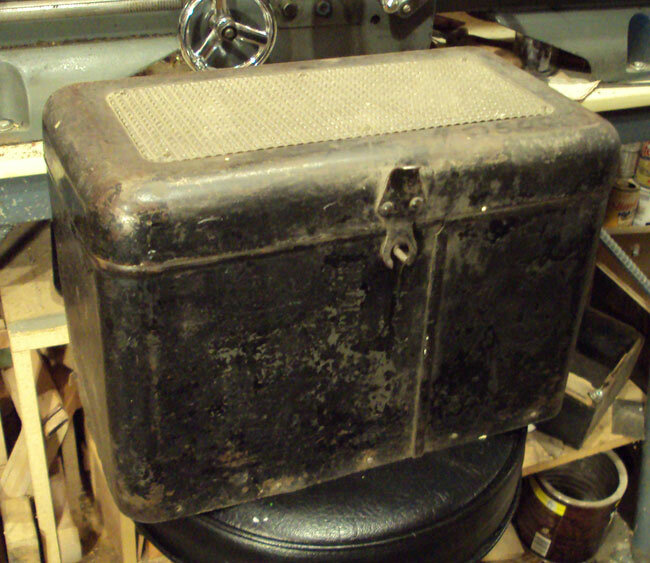 I looked at that box on Ebay before Jim bought it and did give it a thought, but I have one just like it, minus the hasps and they are available from Restoration Supply, so I passed. I do Willie. Re-read my post. It will be used to hold my tools and will be going in my trunk. As I said. 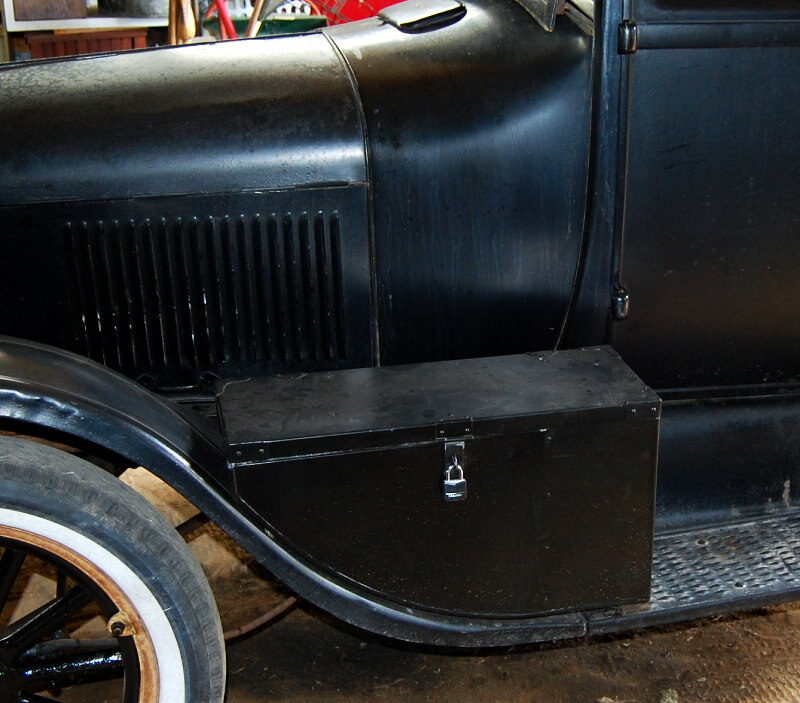 There is no need for a running board toolbox on a coupe with a sizable trunk. I don't have as many tool boxes as Jay, but most of the few I have were pretty cheap due to luck. While I paid $5, $6, and up to $30, that $70 isn't out of line with many I've seen for sale. I carry a small plastic toolbox in my Tudor A......I'd rather keep that stuff somewhere else. Here is a different one that was on my car when I bought it. 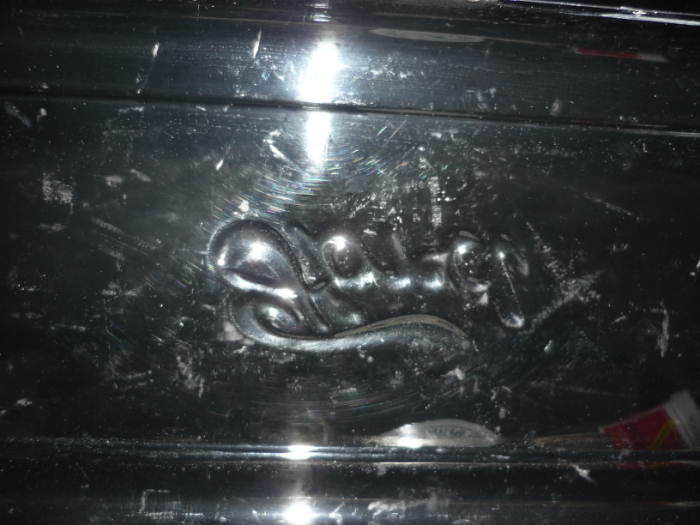 It is hard to see but it is curved on the bottom to follow the curve of the fender. Doug, Looks similar to the box I posted here. Which side does your box hinge from? 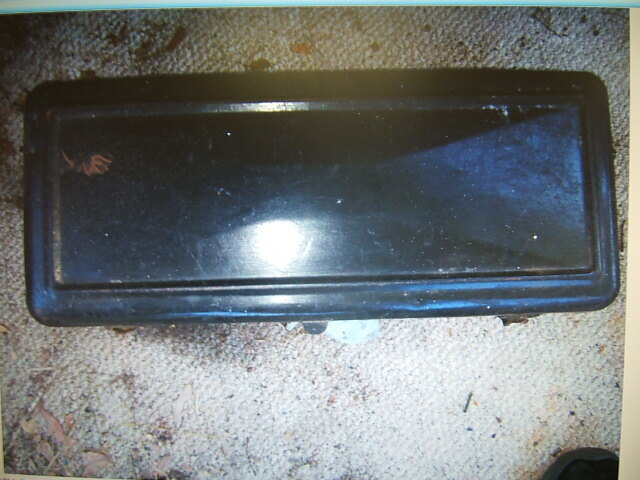 Hinges from the fender or front side. Never have to worry about it opening. It is heavy and the wind keeps it shut. Jay, mine is squared and there is a corrugated rubber pad on top secured by the bright metal trim(aluminum?). Gee, those prices have gone up in 1992 I purchased a pair of E&J 1912 repo brass lights at Hershey and the guy on the next stall gave me one of those boxes to pack the lights in to bring them home. It would be real easy to alter a normal box to fit the front guard and you would have the right shaped lid, those rounded corners add a lot of work to making one. A lot cheaper than making one from scratch. Jay, maybe you need to get to work on couple of your stash with tin snips. Glad to hear your T-bay purchase worked out well. I have a weakness for running board box's myself. PS. I still think you should publish a photo book of all your accessories like Bruce McCalleys "Model T. The Car That Changed the World". I guess my favorite is a battery box. It has an aluminum pyramid inset. I can't tell if Jay's is aluminum or white rubber. It has a hole in the bottom big enough for a cable. Funny place for a cable. The latch looks like it uses a gas light Knob. Anybody have a key that fits these latch-type boxes? I have tried making one but it still needs quite a bit of wiggling. Haven't got the right hills and valleys and depth correct. The latching mechanism appears to be the same for several boxes. I would hate to drill holes and mount a modern padlock type locking plate, but realize the need for some type of security given the array of tools and parts one could carry in such a large box. How about posting pictures next to a scale for the proper dimension? Many thanks! Friend of mine here drove his car and a friends to California some years back, his Wife followed with a trailer and I think another engine. Anyway, he built pull out tray tool boxes for both sides of his car, did a very neat job of it, and hardly noticeable when closed up. If anyone is interested I can put you in touch with him, it is a good idea for something like that trip, one can store a world of stuff in there. Where can I possibly get a key for the lock on the very same box that started out this discussion. I just got the Running Board Box at an antique mart but there was no key. I would like to use it on my car after restoring it. Can anyone help me. I do not even know the maker, only that it is identical to the box with the round integrated lock at the top. Thank you for any leads. I took one to a locksmith and he made some keys for it. Dan, I took mine to a lock smith and had 2 made. Has anyone seen one like this before? 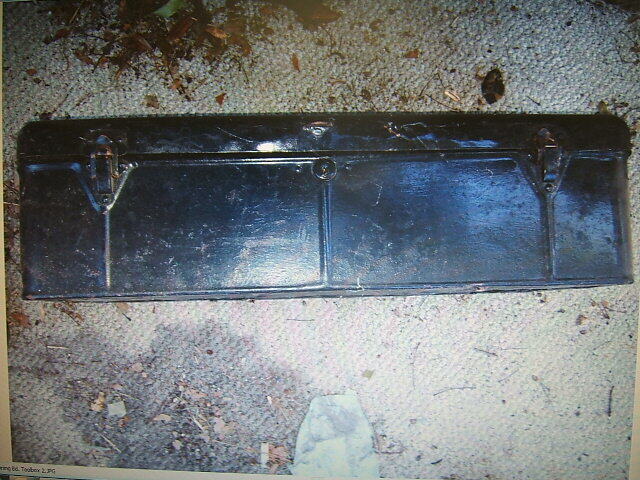 Grady: I would like to know what type of mounting was used on the pull out trays, and how the trays were fabbed. 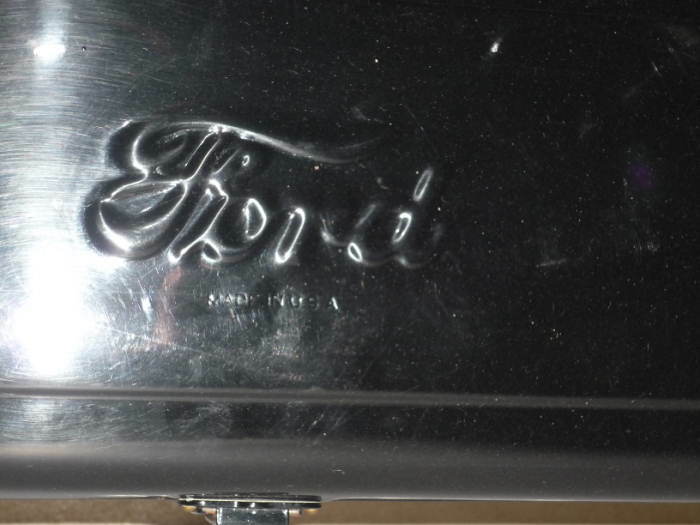 Royce: If you are on the Forum; do you remember how Ralph Z had his under running board boxes made? I think they were on the Paddy Wagon. Jim, Actually these boxes do have a place on a Coupe. 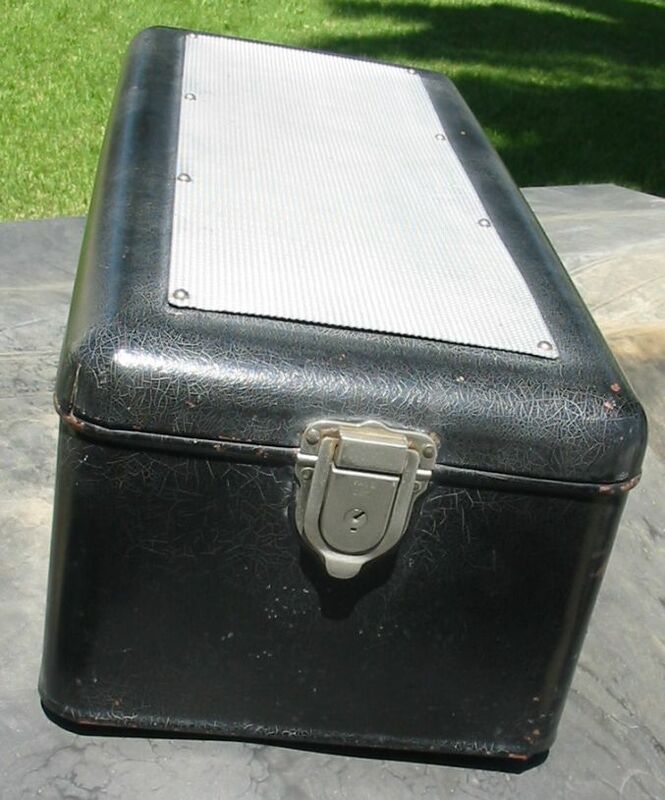 On my 25, which I think has the biggest trunk of any of the coupes: I mounted one of these tool boxes on the running board before I drove it from NY to a weeks vacation in Maine. 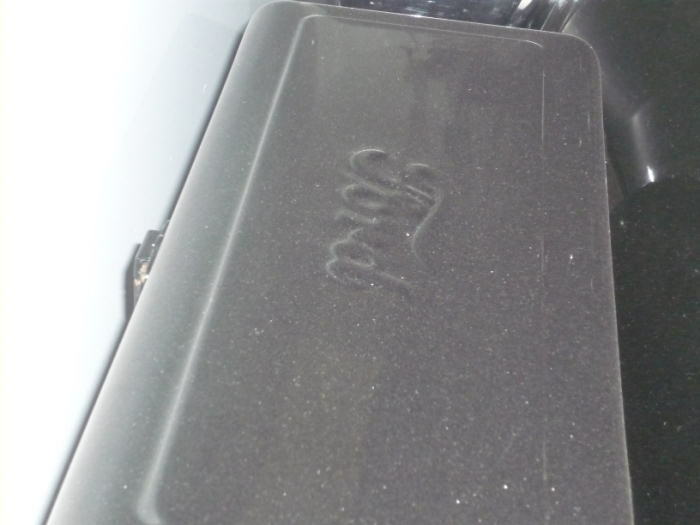 If you're going on a long trip and the trunk is full, the tool box on the running board is very handy. Derek, That has to be the ultimate tool box. I might have to see if I can make one up. Try Mink's Emporium for antique keys.